Despite not doing anything the easy way, the Dodgers persevered a wild and wooly race with the second-place San Francisco Giants to win the N.L. Pennant and earn a trip to the World Series against the Minnesota Twins. While the Giants won 14 consecutive games to take a 4 1/2-game lead in September, the Dodgers countered with a 13-game winning streak of their own and won 15 of their last 16 to capture the crown. 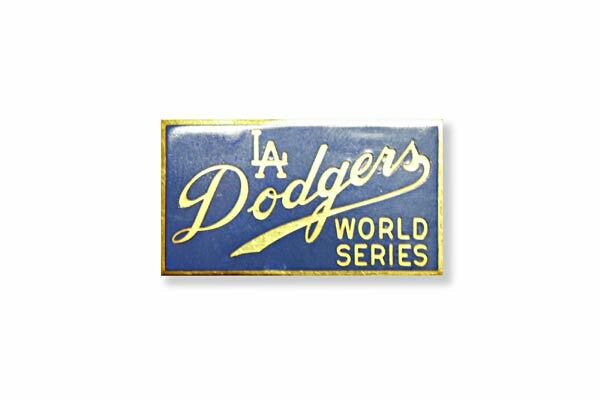 The Dodgers defeated the Twins in an exciting seven-game World Series, clinching the final victory, 2-0, behind ace Sandy Koufax, on Oct. 14 in Bloomington, MN. “Sweet Lou” Johnson hit a game-winning home run to end the season on a high note. 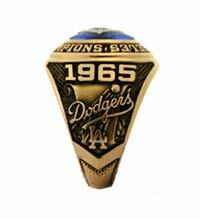 Three days earlier, Koufax also won Game 5 at Dodger Stadium, 7-0, and finished the Series with a microscopic 0.95 ERA. All season long, the Dodgers relied on the powerful left-right punch of pitchers Koufax and Don Drysdale who both had stellar seasons. Koufax set the all-time strikeout record with 382 K’s in 336 innings, while amassing a 26-8 record (most wins in the majors) and capturing his fourth straight ERA title at 2.04. His awesome season was capped by his fourth straight no-hitter in as many years, except this time he outdid himself as he made it a perfect game on Sept. 9 against the Chicago Cubs at Dodger Stadium. Amazingly, the Dodgers won 1-0 as the game yielded only one hit (a seventh-inning double by Lou Johnson which did not figure in the scoring) as Bob Hendley tried to match Koufax pitch for pitch. Johnson scored the only run after walking in the fifth inning. But, when Koufax struck out the final six batters, including Harvey Kuenn, the southpaw put his name on baseball’s immortal list. Drysdale, meanwhile, did his part again with a 23-12 record and a 2.78 ERA. He pitched in 308 innings and led the club with a .300 batting average. Drysdale tied a N.L. record for pitchers with seven home runs. Claude Osteen, another left-hander, fell just 13 innings short of giving the Dodgers three 300-inning pitchers. Osteen, acquired from Washington in the previous offseason, was 15-15 with a 2.79 ERA. He was the season’s victim of non-support as in his 15 losses, the Dodgers managed to score only 28 runs. The Dodgers’ 2.81 ERA was the lowest in the N.L. in 22 years, bolstered by Ron Perranoski’s fine work in the bullpen (17 saves). Shortstop Maury Wills was the leading hitter of the regulars with a .286 batting average and, for the sixth straight season, he led the league in stolen bases with 94. 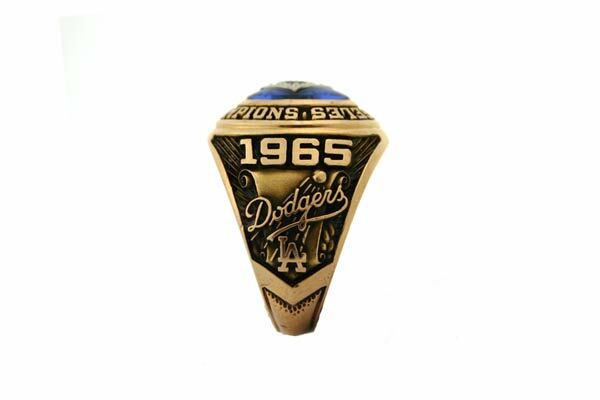 Rebounding from a tie for sixth place in 1964, the Dodgers somehow reached the pinnacle despite a lower batting average (.245) and a total of 78 home runs, fewest in 20 years by a championship club. Injuries, as always, played a big part in the design of the season. Tommy Davis, the club’s two-time N.L. batting champion in 1962-63, fractured his right ankle on May 1 at Dodger Stadium against the Giants and was sidelined for the season. But, in search of a spark to jump start the season, the Dodgers reached into their bag of minor league tricks and pulled out Johnson from Spokane in the Pacific Coast League. Johnson immediately responded with the opportunity that had made him a 13-year professional ballplayer, mainly in the minor leagues by hitting .259 with 12 home runs. With an unsolved third base situation, the Dodgers activated coach Jim Gilliam on May 28 and the 36-year-old became the second best hitter with a .280 mark. That set up the first switch-hitting infield in major league history, with Wes Parker at first base, Jim Lefebvre at second base, Wills at shortstop and Gilliam at third. Previously, Gilliam, an African American, had been hired as a coach to start the season, along with Preston Gomez, a Cuban. One of baseball’s ugliest incidents occurred on August 22 at Candlestick Park when Juan Marichal lost his temper at home plate in the third inning and responded by striking John Roseboro on the head with his bat, severely cutting him and triggering a 14-minute riot. Marichal, who was ejected, was lost to the Giants for nine days and eight playing dates plus fined $1750. He was also prevented from playing in Los Angeles on Sept. 6-7. Lefebvre won the N.L. Rookie of the Year Award, as he batted .250 with 12 homers and 69 RBI. Consistency was a hallmark of the Dodgers as they lost four games in a row just once and never won more than six straight until the end of the season. In the seven-game World Series, pitching was again the name of the game and the Dodgers edged the Twins, four games to three, behind Koufax, who won the World Series MVP award and, for the second time, was unanimous choice for the Cy Young Award. Koufax made headlines when he chose not to pitch Game 1 in Bloomington, MN because Yom Kippur, the holiest day on the Jewish calendar, fell on October 6, 1965. 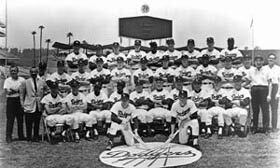 Instead, Alston adjusted and tabbed Drysdale as the starter of Game 1, but the Dodgers lost, 8-2. 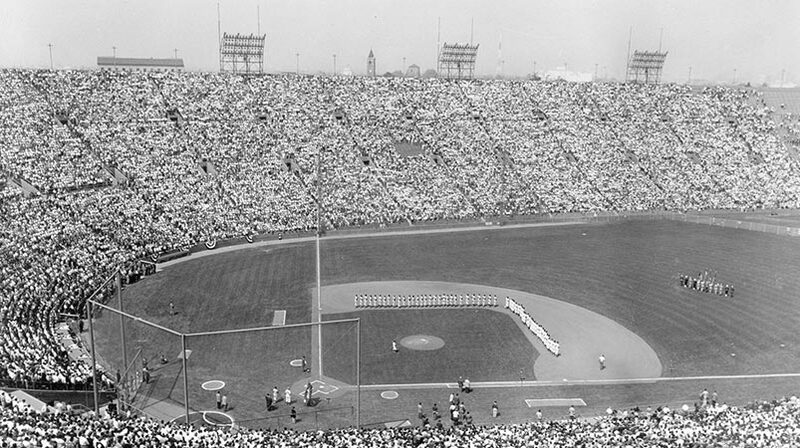 After quietly observing this holy day, Koufax went back to work in Game 2, but he also lost, 5-1. But, the dominating southpaw won Game 5 at Dodger Stadium, 7-0, on three days’ rest and then shut out the Twins, 2-0, on just two days’ rest and without his usually strong curveball back in Minnesota in Game 7 on Oct. 14. In three World Series games Koufax struck out 29 Twins. Alston won his N.L. record fourth World Series. 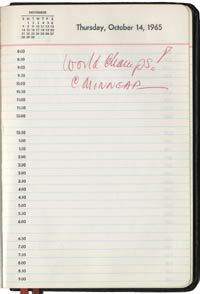 In his personal date book of 1965, Walter O’Malley simply summed up the season by writing the words, “World Champs! @ Minneap...” on Oct. 14. 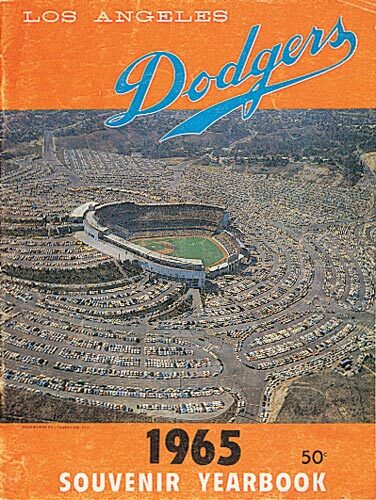 Click image for a larger view1965 Dodger YearbookCopyright © Los Angeles Dodgers, Inc. 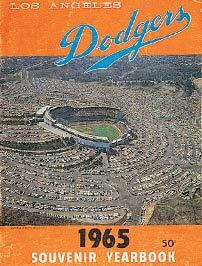 In his personal date book, Walter O’Malley notes the Dodgers’ championship clinched in Minnesota. Click image for a larger view1965 DodgersCopyright © Los Angeles Dodgers, Inc.
Al Campanis, Director; Dwight (Red) Adams, Cliff Alexander, Hugh Alexander, Romanus (Monty) Basgall, William Brenzel, John S. Carey, Leon Hamilton, John R. Keenan, Tom Lasorda, Ed Liberatore, Harry (Ted) McGrew, Greg Mulleavy, Kenneth Myers, Rudy Rufer, Edwin (Duke) Snider, Ben Wade, Guy Wellman, Bert Wells.